Everything we discover, we share it with you! The Mare Calmo Association was founded to promote and enhance the socio-productive and cultural system of Sardinia and the Mediterranean. At the first point of our mission are the constant research and study of excellence, cultural heritage and places of interest. Everything we discover, we share it with you! But like all free and non-profit associations, we only exist through the contribution of our members. Therefore, if you appreciate our work, we ask you to support us by paying a small annual membership fee. You can do it directly on this site! All contributions will be invested in the activities of the Association, and like members you will able to propose in addition to participating. Communication of the cultural, archaeological and landscape heritage. Cooperation with organizations and associations that share our mission. Organization of cultural events on historical and archaeological issues. What are you waiting for? Your support is very important for us! 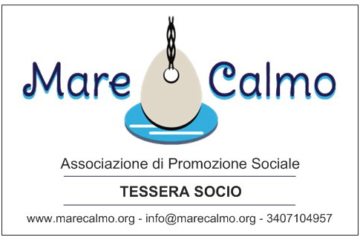 Support and partecipate to Mare Calmo with the membership card so that our activities continue, grow and prosper.